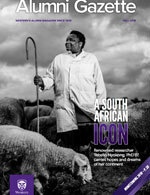 The Western Alumni Gazette is an award-winning alumni magazine that we write, edit, and publish three times a year. Sent to more than 175,000 alumni, the Alumni Gazette provides provocative, entertaining, and thoughtful news and features about Western, its people, and its alumni. 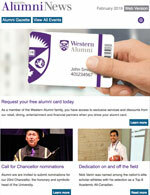 Western Alumni News is Western's monthly e-newsletter that informs alumni, faculty, staff, and students about alumni news, campus news, giving news, events, affinity partners, and more.